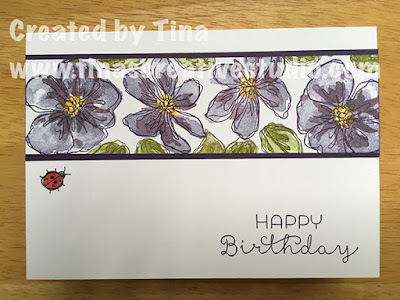 I used the gorgeous Penned & Painted stamp set for the first time this week, and made 3 different cards with it. With this one I heat embossed with copper embossing powder the greeting (from the Designer Tin of Cards stamp set) and the outline images of the flowers and leaves. I did this on a panel of Shimmery white cardstock, which works well with the watercolouring technique I used. I used my aqua painter to pick up the ink colours from the lids of the stamp pads, after squeezing the closed ink pads to transfer ink to the insides of the lids. The colours I used are Flirty Flamingo and Peekaboo Peach for the flowers, and Emerald Envy for the leaves. I used Daffodil Delight for the flower centres. Once dried I attached the Shimmery White to a Basic Black mat and then to the Flirty Flamingo card base. 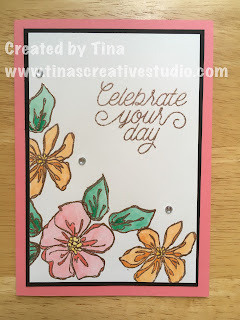 A few basic Rhinestones add a bit of bling to finish off the card. Welcome to our World Card Making Day Blog Hop using current Stampin' Up!® Products. This is such a fantastic way to celebrate this event with lots of amazing inspiration for you. 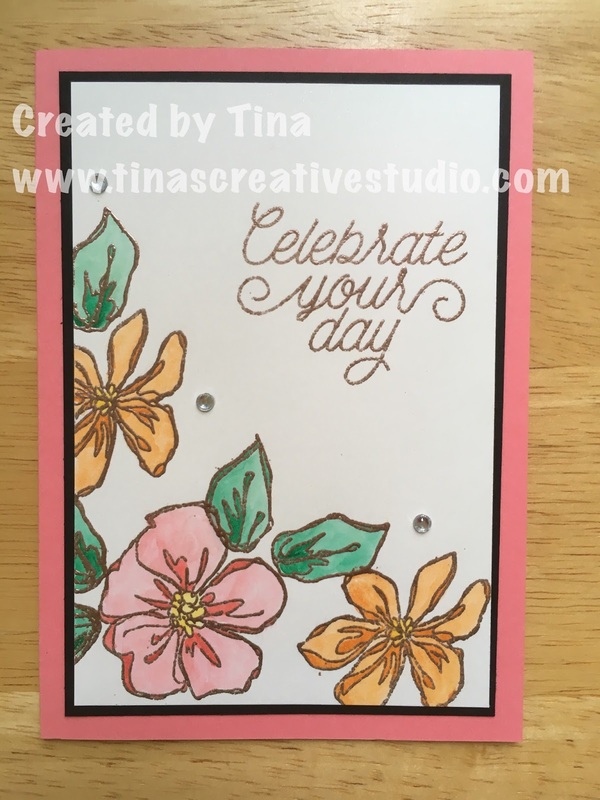 You are currently visiting my blog - Tina Hewett, of Tina's Creative Studio in Australia and you will be visiting lots of different places in your hop today. There is a list at the end of the page which will help you to move along from blog to blog so you see 20 amazing projects all up. I started out by embossing a piece of Whisper White cardstock with the Brick Wall embossing folder. Then I stamped the Watercolour Wash background in Sahara Sand ink over the embossed panel. 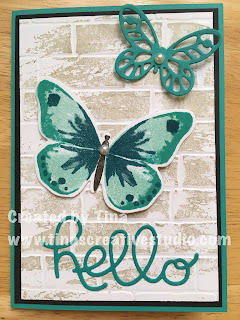 On another piece of Whisper White cardstock, I stamped the larger butterfly in 3 layers using Pool Party, Bermuda Bay, and Island Indigo inks and cut the butterfly using the matching framelit die. The body was stamped using Early Espresso ink. The detailed small butterfly and the greeting were die cut out of Bermuda Bay cardstock. Thanks for visiting my blog today, there are so many amazing ideas and inspiration you don't want to miss. Remember that currently you are at my blog - Tina Hewett, so check the blog hop line up list to see who is next in the list.